Every once in a while I do open an email I never signed up for, and some of those times, I am pleasantly surprised. This is one of those times. No idea whatsoever how I got on Renewed Living‘s mailing list, but they do have some nice recipes on their blog. Check them out. You’ve got to love Amie Sue Oldfather and her Nouveau Raw creations! She just doesn’t stop coming up with great ideas. 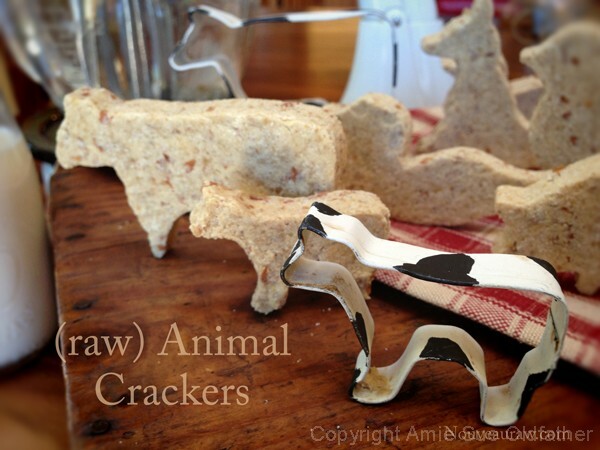 Her photo here shows the raw animal crackers she has come up with this time! Cute, tasty, and easy enough to make. The step-by-step instructions with illustrative photos and useful tips make this recipe look do-able. If you haven’t visited Nouveau Raw, now is the time to go there. I always find something there that I haven’t thought of before. It really is a one-stop shop, brimming with great recipes and wonderful ideas. Okay, folks, I have scored! I have tracked down Heidi Ohlander, from the wonderful, but now defunct Raw Food Right Now, and been allowed a glance at her Easter Recipes book. Hustle! You still have time to make this before Easter! Process pecans and almonds to a smooth consistency in the food processor. Set aside in large bowl. In the food processor, process onion and apples to a coarse consistency. Add to bowl with pecans and almonds. Add spice blend to almond/pecan/’onion/apple mix in bowl and mix well. Place roast mix on Teflex-lined dehydrator sheet. Shape mixture to no more than 3 in. high. Sprinkle dry rub onto top and sides of “roast”. To have a crispy shell, ensure that dry rub covers every part of roast. Dehydrate loaf for 4-8 hrs at 120 degrees. The finished roast should be slightly firm to touch. Spread apricot glaze over entire roast. To serve, slide loaf onto serving platter, and surround with greens, grapes, or decorative fruit, if desired.